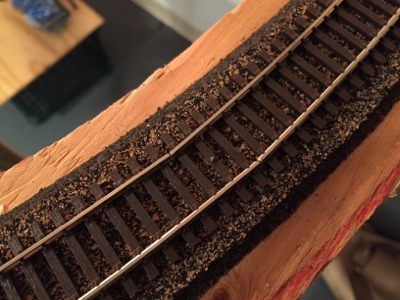 I know, I know, you don't usually associate ballasting with "fun," do you? Well, you're clearly doing it wrong! 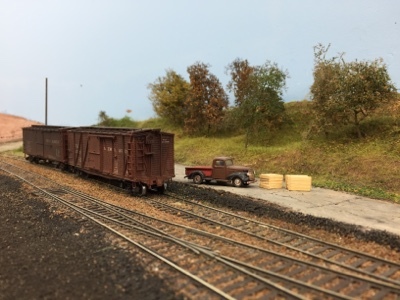 Having trouble spreading and tamping the ballast on your model railroad? Tiny rocks getting everywhere, except where you want them? Lots of itsy bits left on top of the ties? Try using an orbital sander to vibrate those little grains and nestle them snugly in-between the ties, where they belong! And, just for the record, no - I would not recommend that you apply the sander directly to the rails. . . I've been trying to figure out what colors to paint New Haven Railroad related structures, c. 1947 (click here and here for the discussion so far, and don't forget to check out the comments). The biggest challenge, of course, is finding color photos from the era. 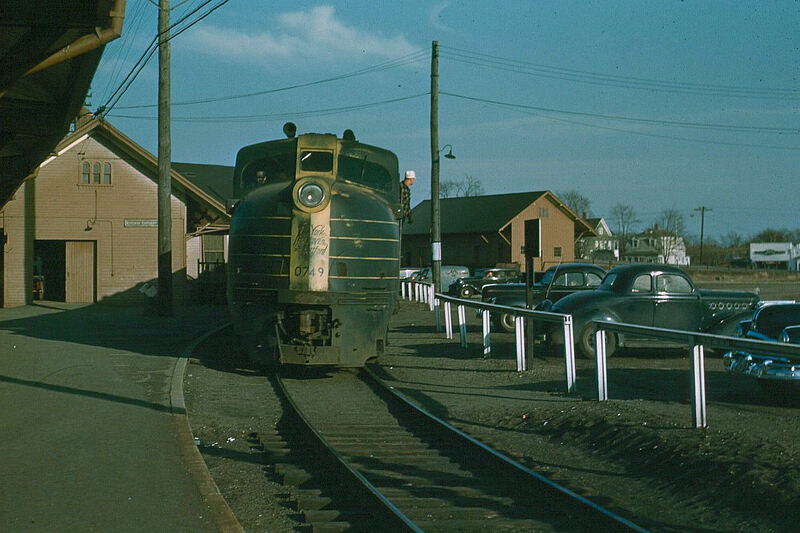 This one. . .
. . . from the spring of 1949 (according to the photographer, John Wallace) shows the Old Saybrook station and freight house in a monotone "all brown" color. 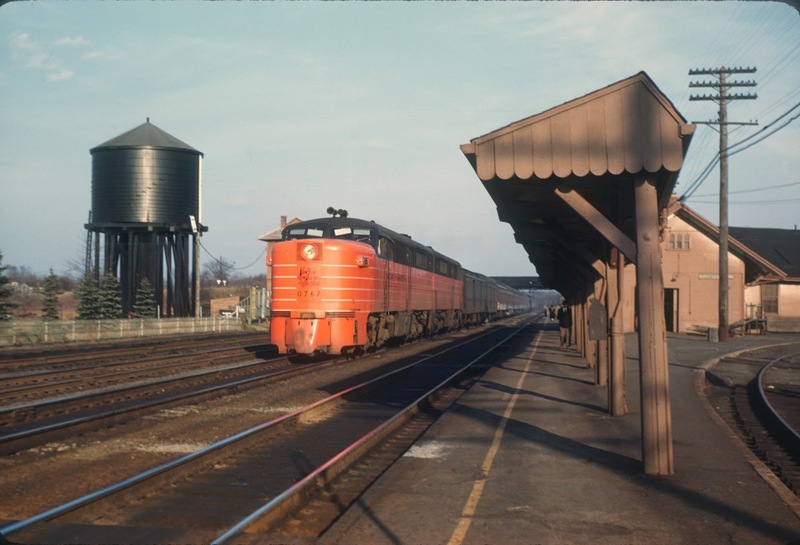 While we don't need to go into actual colors here (since I did so here), this photo is helpful for establishing a point in time by which the freight house, for example, had been repainted from an earlier "two-tone" scheme. In case you can't read the caption, this is a shot of the Old Saybrook freight house in December 1946. Dec. '46 to early spring '49 is a MUCH narrower window - heh, but it still doesn't solve my problem. I still don't know precisely how the structures were painted in October, 1947 (my chosen modeling period). So, I thought it would be bright idea to cut my gaps in the curves on both ends of the dog bone in order to isolate the reversing section and make it as long as possible. I just succeeded in ruining that curve and will have to redo it. Turns out cutting gaps on curves will introduce a kink in the curve. So much for soldering the track to make it flow smoothly. "The older paint scheme of the tower was a tan with brown trim . . . [t]his color was confirmed during a visit to the tower . . . [p]eeking inside, we found the inside of the stairway to be painted with the tan color." They suggested using a 60:40 mix of Floquil Flesh and Foundation for the tan color ("cut with just a little bit of white") and Floquil Rail Brown for the brown trim color (lightened with a little white). Since I'm not sure how that will actually look compared to the color photos I've discovered (and also because I haven't yet found a bottle of Floquil Flesh), I'm going to wait until I can make a color swatch as a test before painting the model. Alternatively, I could follow what BillC used for his model of the Canaan, CT station - PollyScale Rust. He used that for the walls & trim, painting the window sashes white. Joe's model - a photo of which I reluctantly include here since it far outshines any of my modest efforts! He used Testors Model Masters paint - Military Brown # FS 30117(F) for the trim (darker color) and Radome Tan # FS 33613(F) for the lighter tan color of the walls. While the New Haven certainly painted its structures in colors other than what I've described here (i.e. red with white trim starting in the 1950s), these paints should give you some pretty good options for what NHRR buildings typically looked like during the 1940s. Of course, the best guidance I can give beyond what's here is to find photos of the particular structure you're modeling, preferably from your chosen era. Those photos, by far, would be your best reference. But as you can tell from my saga of Saybrook tower, such resources aren't that easy to come by. The colors suggested here will at least get you started. Here's the Saybrook scene with the backdrop in place and (almost) ready to paint. As you can see, it's pretty dark, and before I do my last coat of topping and start painting, I really want to be able to see what I'm doing. So it's time to Install Lighting. Shop Lights - $10.97 each and bulbs $4/pr at WalMart - though I have to admit, noticing the reviews while preparing this post, I'm wondering how wise this choice will end up being. All I can say is that I've used these over my older section of railroad for 2 1/2 years now without a problem. If you have an unfinished basement ceiling (first of all - why?? At least cover your ceiling joists with plastic to keep dirt & dust from raining down), you can just attach the lights to the ceiling joists. But if, like me, you have a drywall finished ceiling, what do you do? Well, you can use a stud finder to "see" where the joists are and screw your mounting hardware into them. Or.... you can do what I do. . .
Screw in your hook and hook on your light chain, adjusting for height. Get yourself a couple of small binder clips and some picture hangar wire. Attach the wire to the clip as above. Clip to the front (layout) side of the light, in line with the chain - and then attach the other end of the wire to the hook, pulling up the layout side of the light. Voila!! Instant faux valence! The light is directed away from the viewers and the aisle and directed instead toward the layout. This isn't a perfect lighting solution, but it's certainly inexpensive. And, with a little adjustment, can be make to look almost as effective as a full lighting valence, with a fraction of the time and expense. Even though it's not totally necessary (I'm already getting 90% of the desired effect), I'll likely add a valence anyway, if only to hide the shop lights and wires from view. I'm debating using some of that vinyl flooring I have left over (much easier on foreheads) - otherwise, I'll go with a more traditional masonite valence. Thankfully, given how well this scene is now lit, there's no hurry to decide. I'm considering using switch machines for the turnouts in the Saybrook scene. Thing is, I haven't used or installed a switch machine since I used Atlas Snap-Track back in the early '80s. And "install" is overstating it with those things. So I'm pretty intimidated by the prospect of powering my points. Thankfully, PeteL had on-hand a spare of the machine he uses: The SwitchTender from Micro-Mark. And, even better, he agreed to bring it over for me to try. It installed so fast, I forgot to take many pictures along the way, so this is from Micro-Mark's website. I approached this install fully expecting to spend the whole afternoon, taking my time to be careful. Consequently, I was very skeptical about the "Installs in under 5 minutes!" claim. But I have to say, while it did take me longer than 5 minutes, I really can't imagine the install being any easier than it was. Things went very well according to the instructions (which you can view here for more details). Since my turnout had not yet been installed, things were especially easy. The instructions for installing the machine on an in-place turnout are understandably more involved. That all being said, I quickly discovered (and Pete filled me in on) a couple of tips that the instructions don't mention, but which I think you'll find helpful. I sure did. Tip #1 Unless you're afraid of scenery material falling down through the hole, drill a 1/4" hole for the actuating rod rather than the 2-1/8"-holes-side-by-side-and-1/16"-apart that the instructions call for. They intend for you to make a little slot for the rod to move in, but it's a very fussy process and would likely be fussy in operation. Best, in my mind, to provide lots of clearance, and more easily. Tip #2 If you're using Micro-Engineering turnouts, you should remove the little point locking spring since the machine isn't quite powerful enough to move the points against that spring. Besides, you want the points to move smoothly - not snap over. Tip #2a Speaking of ME turnouts: the supplied actuating rod (for newly installed turnouts) is .046" copper wire. The holes in the ME turnout throwbar are a bit smaller (.035"), so I used a small (#56) drill bit in a pin vise to ream out the throwbar hole. Incidentally, while ME turnouts have 3 throwbar holes, I opted to use the center one. Two little wood screws, set behind the machine mounting bracket, to prevent it ever twisting or turning. Tip #4 Use a 7/16" wrench to tighten the bracket around the machine. The instructions don't mention needing this tool, but you won't be able to get the bracket nut tight enough with just your fingers. I tested the machine by hooking up a pair of temporary wires from the motor lead & resistor to an old 12v power pack. Worked like a charm. To move the points the other direction, I just switched the wires. Of course, that's just for testing. For a permanent install, you'll want to use a DPDT toggle switch to reverse the polarity - or the Micro-Mark-recommended 3PDT switch (if you plan to power the frog). The last step, once I was satisfied everything was well-adjusted and working properly, was to cut off the excess actuating rod. As you can see (or not), it's barely noticeable. All in all, I'm very happy with the machine and how easy it was to install. While it did take me longer than 5 minutes, I can certainly see me getting to sub 5-minute installs after another install or two. The SwitchTender is also economical: $15.95 for a single, down to under $12 each for 100 or more. Check the website for quantity discounts at other levels. 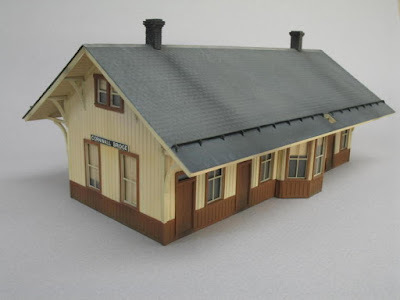 Even at those prices, powering turnouts isn't an inexpensive proposition no matter how you cut it, and I don't even have that many to do (the rest of the layout outside Saybrook will be all manual turnouts). And remember you'll also need to buy a power supply, toggle switches, and wire. But the idea of having at least my mainline turnouts powered in Old Saybrook is VERY attractive. I've been researching the Saybrook tower (here and here) and it would be awesome to be able to have a "Tower Operator" position during operating sessions. I just don't know whether that'll work logistically - Is there any limit to the distance the toggle switch can be from the switch machine it controls? I'm considering having all the Saybrook turnouts operated by toggles on a control panel above what could be a "towerman's" desk - which is about 10-15' away. It's certainly an intriguing idea, but first I need to decide whether to go to the expense of all those machines. At least in the case of the SwitchTender, I won't have to worry too much about the installation.